Wholesale Premium Quality Tulle Rolls are Perfect decoration fabrics for wedding, party and special occasions. Available in 12" rolls. Wholesale Tulle Rolls are great for Crafts & Sewing & more. Find wholesale tulle at the lowest prices and in stock from Razatrade.com Available in 15" roll. Wholesale Prices on 6" Tulle Rolls. Tulle Rolls and Spools are great for crafts or style your Rooms with Colorful Tulle Decorations . A thousand dots of dazzle. These wonderful fabrics are true eye candy. An attractive and charming fabric for any lifestyle. Are you tired of the events where the ambience is too loud? If the answer is in the affirmative, then a fabric that offers a more natural touch is a natural choice. The Authentic Rustic Burlap Roll can cater to your natural looking requirement at ease. A stunning fabric choice Bubbling with Passion. A non-woven fabric bolt. A wholesale priced linen that's environment-friendly and biodegradable. The beauty of the butterfly is a wonderful display on the butterfly explosion fabric bolt. Make your event mesmerizing and stunning by accessorizing it with Checkmate Satin Checkered 54" x 10 Yards offered by Razatrade.com. This great quality fabric is a must-have to accentuate the overall look and feel of your event. Despite of the market being flooded with fabrics of newer patterns and designs, the Chevron pattern with its classic design is still in demand. The parallel V-shaped pattern of the Chevron Pattern Fabric Bolt is accentuated by the rows of sequins that form the pattern. Elegant Chiffon Fabric Bolts lightweight, A balanced plain-woven sheer fabric choice. A unique fabric bolt with the appearance of cracked shells. Crinkle Taffeta offers depth and elegance with this stylish fabric choice. Wonderful dancing lines fabric bolts are great for party and weddings. Get your Diva on with Diva Necklace sheer Fabric Bolts. Sparking Organza Fabric Bolts are perfect for Parties, Weddings & More. If you're on a budge, our econoline Satin fabrics won't sacrifice quality. These elegant fabrics are a great bargain. There's nothing finer that a handicraft embroidered fabric. Flowing fabric patterns of Fair winds and gentle sea are a relaxing stress free choice. Instill passion, tranquility and elegance to the ambience of your next event. Drape the table and chair ensemble with the amazing Fleur Lace Fabric Soft Sheer. A fashionable style linen for your bridal preparations. Flocking Damask is a popular choice to consider. Fun Floral patterns on a see thru fabric bolt. View our variety of color choices. The beauty of a floral forest extravaganza. Shop our large select of color choices at wholesale prices. A shiny eye catching friendship sheer fabric bolt in a variety of colors and variations. Opulence is something that we all would like to indulge in. So, how wonderful it would be, to introduce the quality of opulence to the next event that you are hosting? The probability is you would never disagree to such proposition. In such case you may get the Glittered Damask Flocking on Organza. A botanical dream fabric of grass see thru fabric bolts. Modern and stylish. Get your groove on with our Groovy dots fabric bolts. A retro twist to our large choice of fabric bolts. The heart symbol fabric bolts is one of our best sellers. A lovely variation of heart in a sheer non-woven fabric bolt. A dazzling array of lines on a sheer fabric. Exciting yet elegant. View our colors and see for yourself. Chevron "Wave" Style will bring an exciting energy to any room. The Chevron Zig zag motions symbolizes waves, lively music and will put your guests in an upbeat mood. Get your Animal on with Leopard Spot fabric Bolts. An exciting addition to our Animal print fabric bolts. Our Lustrous Tulle Rolls come in a variety of color choices. Bright and elegant our sheer mesh Fabric Bolts are a wonderful choice for your fabric project. A tropical dream, Paradise island see thru fabric bolts are guaranteed to cause daydreaming. Whether you are an event planner, hospitality professional, wedding chapel, hotelier and any other hosting professionals, one thing that always strive your mind is creating a right tone for the event. Neither too jazzy nor too subtle but indeed impressive! So, if you are looking to buy something refined for your event, then try the Patterned Zen Art Satin Fabric Bolts offered by Razatrade.com. The poinsettia is a culturally and commercially important plant species of the diverse spurge family. This is a beautiful see thru fabric that is sure to turn heads. If you are a professional host, you must be aware of the importance of good quality table and chair fabrics in hosting a gala event. The demand for a good quality fabric that combines both look and high functionality has always been high. A leaf style linen that's see thru. The materials are a Non-woven Polyester with prosperity leafs using foil printing. Most of the people, if not all, are fond of gazing at the stars on the sky during the darkness of night. The beautiful glitter of the stars amidst the dark skyline, stirs passion in our hearts. You can infuse similar kind of passion among your guests with your table and chair ensemble dressed beautifully with the Sequin Studded Lace Fabrics. Sparkle and Shine, our Beautiful Sparking Glitter Organza Bolts are super popular. Check out our wholesale prices! Dreamy Starlight sheer fabrics with an array of stars in various sizes. A unique zebra pattern that you've never seen before, sheer and wonderful. A visual delight. Putting together a festive event has never been easier with Taffeta Sequin Fabric Bolts. Wholesale Tulle Circle Favor Wraps are a must for your special part or event. View our large selection of unique color. Your guaranteed to find what you need when it comes to Tulle Circles. The fine detail of these fabrics are a treat for the eyes, a stunning display of circles and shapes . Get wild with our Animal Zebra Striped Fabric Bolts. You must see to believe. These fabrics are gorgeous. 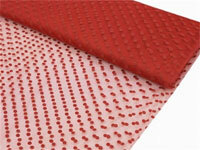 WholesaleTulle Fabric is popular for Arts, Crafts , Sewing & more. We offer Tulle Fabric bolts at everyday low prices. Shop for the finest Polyester Fabric bolts at Razatrade. Quality Mini Rosettes Fabric Bolts at wholesale prices. At Razatrade.com, we believe that nothing should stop you from being creative and innovative in your party table or backdrop decoration approach. With products like these Premium Raffia Fabric Bolts, we let the do-it-yourself event planning spirit inside you to come out in open. Fabric Bolts by the Yard We are able to offer fabric bolts by the yard. at wholesale prices. Our very large selection of Tulle Rolls, Chiffon Fabrics, Taffeta, Satin, Organza, Embroidered, Flocking, Sparkling and more are the best value for your dollar. Our fabric bolts are shipped from California and leave our warehouse withing 24-48 hour, direct to your door. Are you the do it your self event planner or bride, our wholesale fabric bolt selection will make all of your projects possible. These affordably priced fabric bolts come in a full stylish selection including fashionable flocking damask, crisp chiffon, and trendy taffeta fabrics. Whether you’re looking to build a beautiful backdrop, design your own table linens or even craft your own wedding linens and napkins, our many quality fabrics will make it all possible. RazaTrade has all brides, caterers and other planners covered with our large selection of materials and patterns to choose from, including zebra stripes, leopard spots, flocking damask and more. All of these fantastic styles can be incorporated into your homemade wedding linens. We even carry full backdrops already sized for your event. There’s no smarter solution for all of your wedding decorating plans than to do it all yourself. Shop the full selection of organza, tulle, and satin fabric by the bolt for your next event.